Yes, you’ve read that right! Seventeen cities in Europe for under $500 in one trip by plane via SkySurf.Travel. No mile points needed. All non-stop flights! According to this article How to Hit Europe’s Greatest Cities for under $500 in One Trip, you can visit 15 cities in Europe for under $500 by bus or train. That’s a great deal, but what if you would rather fly and get to your destinations faster, and pay even less? Or possibly mix it up a bit with plane, bus, and train to get even a cheaper deal? That’s totally a matter of preference. You might enjoy sightseeing when riding a bus or train, while reading a book about your next destination, or perhaps you prefer flying through the sky with a bird’s eye view of the lands below? Now be forewarned: The prices below were found during the time of writing this blog. Prices change frequently for flights. You can still find great flight deals for under $500 if you plan your own economical travel route using SkySurf.Travel. Possibly even cheaper, or slightly more expensive, depending on the time of booking and where you want to fly to. Also, some airlines such as Wizzair allow passengers a free small cabin bag carry-on the size of 42 x 32 x 25 cm. To see what a carry-on bag of this size looks like, click here: http://amzn.to/2whwXxn, so packing light is a good idea if you want to fly for really cheap. If you need to travel with a larger carry-on, some airlines may charge an extra fee. Please see baggage policies of each airline before booking. In this blog entry, I will show you how you can visit 17 cities in Europe for under $500. All non-stop flights. Not too bad, eh? Seventeen cities in Europe traveling by plane for $487 with taxes included! I clicked on the “Multi-city” tab and entered in my departure city, which is London, England (LOND). I then clicked on “Depart Date”, clicked on “June 2017”, and finally the “Search Best Deals!” button. I choose the date when I want to depart, and then click on the “To another destination” link, or click the “Back to London Luton LTN” link once I want a return flight back to London. I repeat this process until I’m done adding all my flights to the BookIt List. It’s possible to go even lower in price! Try it out yourself (possibly even with trains, buses, or ferries) and let me know what great itineraries you can come up with. Try Asia! It’s also cheap to get around by plane. And even the entire world! 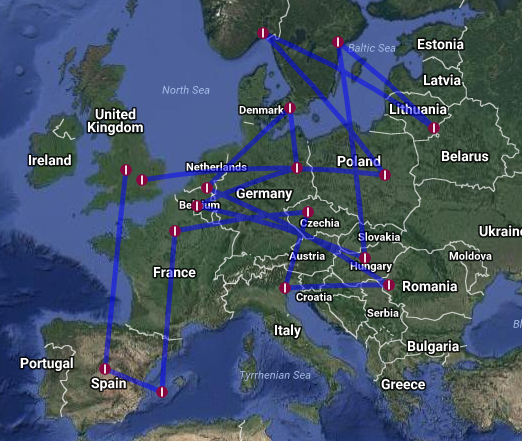 It’s definitely a good idea to use planes to travel throughout Europe. I recently traveled to Barcelona, Spain and Porto, Portugal via air. The extra cost is totally justified by the amount of time you save. Travel itself can be a very exhausting part of vacation. An occasional train ride is nice, but I’d rather spend time enjoying the destination. Next Next post: Don’t know where to go on your next vacation? SkySurf.Travel is here to help you find the greatest flight deals.